Our stay in Montserrat last month happened to coincide with the annual conference of the Leeward Islands District of the Methodist Church in the Caribbean and the Americas, held in Montserrat for the first time since the volcanic disaster of 1995-1997. Translated into Anglican terminology, this was the equivalent of a diocesan synod. We tend to forget how multilingual the Caribbean is. The Leeward Islands Circuit District covers not only the formerly British islands of Anguilla, Antigua and Barbuda, Dominica, St Kitts-Nevis, and the still British Montserrat and the British and American Virgin Islands, but also the Netherlands or ex-Netherlands Antilles (nearby St Martin, Saba and St Eustatius, and distant Aruba and Curacao) and missions in the French island of Guadeloupe. So we had greetings not only in English but also in Dutch, French, Papiamento, “patois” (i.e. Kwèyól, the French Creole spoken in Dominica) and Spanish — though not in any English-lexicon Caribbean Creole. We had Bible readings in French and Dutch as well as English. Most of the service, though, was in English. This provided a useful opportunity to observe varieties of clerical English from throughout the Leewards. I was struck by how homogeneous they all were. 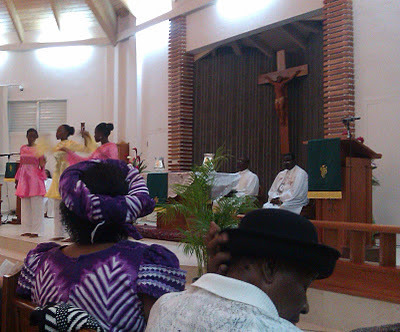 In the formal style of a church service I really cannot distinguish an Antiguan from a Kittitian from a Virgin Islander (though perhaps locals could). From an EFL perspective, all fall very clearly under BrE, not AmE. In most BATH words they have the long vowel, the same as in father. Except to some extent in NURSE words, they are non-rhotic (and in this the Leeward islanders differ from Jamaicans and very strikingly from Bajans). Local characteristics include usually monophthongal FACE and GOAT vowels and merged NEAR-SQUARE, together with variability in θ~t, ð~d and variable cluster reduction. This applies even to the delegates from St Thomas, St John and St Croix, which have been American for nearly a century but whose inhabitants retain the British-style English their forebears had under Danish rule. Pronunciation reminder: ænˈtiːɡə, bɑːˈbjuːdə, ˌdɒmɪˈniːkə, ˈniːvɪs, ˈseɪbə, krɔɪ. Funny, the pronunciation ænˈtiːɡə -without a w between the g and the ə. Despite the impression given by Wikipedia, it is and as far as I know always has been ænˈtiːɡə in BrE (see, for example, DJ's EPD). In colonial days it was an important English/British naval base. Only people unfamiliar with the place would use the spelling (or Spanish) pronunciation with w. As for why it is so pronounced, I don't know. What's the difference between the Leeward Islands District and the Leeward Islands Circuit? So presumably "The Leeward Islands Circuit covers not only ..." should read "The Leeward Islands *District*"? Isaac Asimov, in addition to writing science fiction and popularized science, also wrote limericks. He was bi-accentual, but he wrote his poetry in his native New York accent, so it is non-rhotic. His limericks often exploit deliberate mispronunciations for humorous purposes, like rhyming utter her with Kama Sutra and pronouncing pièce de résistance as plain English. Who said to her mate, "What a pigua!" Or do you refer to my figua?"